SingPost has apologised to a Stomper and compensated him $68, for losing two silver coins worth £100 (around SGD$180) which he ordered from the United Kingdom in May. The Stomper ordered the items, which he realised he did not receive in June, from The Royal Mint's website. Each coin costs £50 (around SGD$90). He contacted Stomp to share the incident after apparently contacting SingPost several times. He said he checked the Royal Mint website in June and it showed that the mail had been delivered from the UK to Singapore on May 18. He then said he proceeded to check the SingPost website and saw that the items had been delivered to SingPost on May 19. According to him, he contacted SingPost via their website on several occasions. He said he emailed them on June 6 and received an auto-reply that they would be in touch within three working days. He waited but said that he did not receive the email. He told Stomp he emailed again on June 19 and received a reply on June 20. According to him, the reply stated that his case was under investigation and that SingPost wanted another three days to resolve it. He said he emailed them again on June 25 to which they replied that they would reach contact him in three more days. "Three days later, on June 28, SingPost requested for three more days," said the Stomper. The Stomper said that they emailed him on July 3 to tell him that his package was lost. The Stomper said: "They told me to contact the sender, The Royal Mint, who was to get in touch with their post office for compensation." He said that SingPost told him that they would only be liable for the sum of $68, to be paid to the sender. "This incident has been going on for five months," he added. Stomp understands that money has been compensated to the Stomper directly. A staff member of SingPost explained that in the terms and conditions under registered mail, the maximum amount of money that can be compensated is $68. Usually, the sender has to bear the costs of mailing and shipping, however, since the Stomper is the one buying the goods, he has to bear the costs. 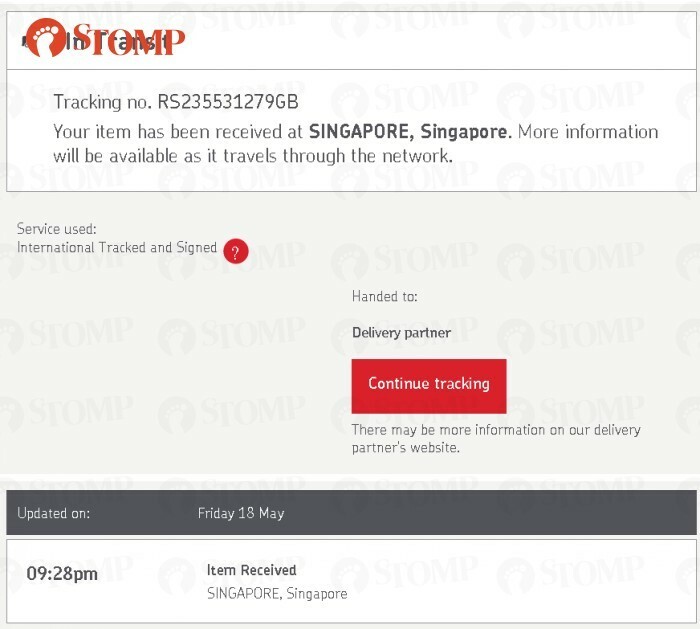 In response to a Stomp query, a SingPost spokesman said: "While our records show that we received Mr Crean’s package on May 19, we unfortunately do not have further information about the package, with no trace of it at our Delivery Base and Returned Letters Unit. "We have reminded our postal staff to take greater care in handling mail and have counselled our customer service staff who should have kept Mr Crean updated on the investigation. "We sincerely apologise to Mr Crean for the service lapses and thank him for accepting our compensation."